St. John's Hill, Battersea. The scene looks so much more lively and vibrant than it does today. 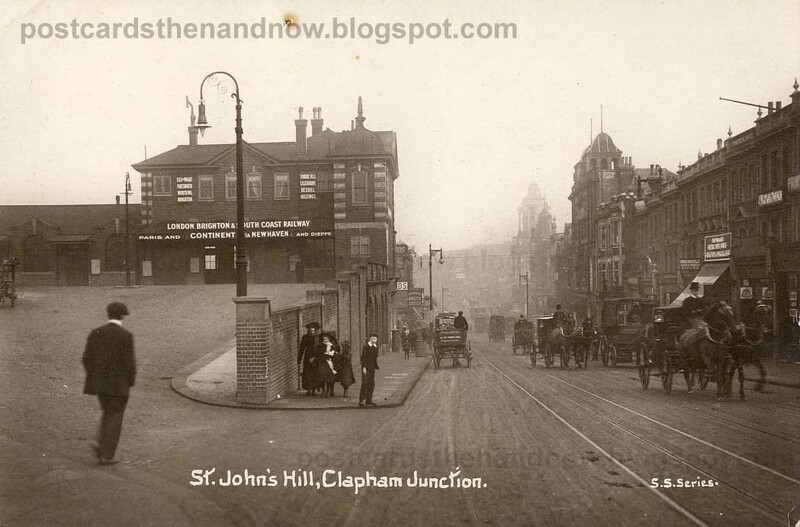 On the left, the old entrance to Clapham Junction station. Curiously, Clapham Junction is in Battersea, not Clapham. The station used to claim to be the busiest in the world. It is now arguably the busiest in Europe, though only in terms of the amount of trains that pass through it, not the number of passengers that use the station (or rather 'customers' as South West Trains prefers to call us now). On the right you can see the magnificent Clapham Grand Theatre, still in use as a music venue and club. The tower in the distance is Arding and Hobbs department store (now Debenhams), rebuilt after a terrrible fire in 1909. Postcard by Sidney Smith.